I've really liked inferring and I hope we learn about it more through out the year.From the paraghraph I read I inferred it is at the beach.I've made some inferences but I havn't written much of them in my reading journal. I think I should write more of them in my book more often.I think making inferences has helped me understand my text a lot and I try to use this anytime and anywere I read.What have you all learnt from inferring? Hi there, In 5/6B we have been using inffering in our writting. Inferring means when the author is using clues to get to the feeling or emotin that the person or thing is feeling eg.It was a cold windy night, the doors were slamming. I can hear the wolf howling. Have you been using inffering? I am glad that you have enjoyed learning about inferring. What clues were there in the text that made you think the author was talking about the beach? It is a great idea to track what you have done in reading in your journal. That way you can reflect on what you have done and if you need reminding you have all of your work there. I believe that inferring is an important skill to learn so you can understand the text without not understanding the book. I think that the paragraphs are discribing how they felt and were they were. I am inferring that I think the 11 year old girl is going to not understand that the ginormous snowman is here father. It has help me to understand the book without asking myself I dont understand that what is it trying to tell me. 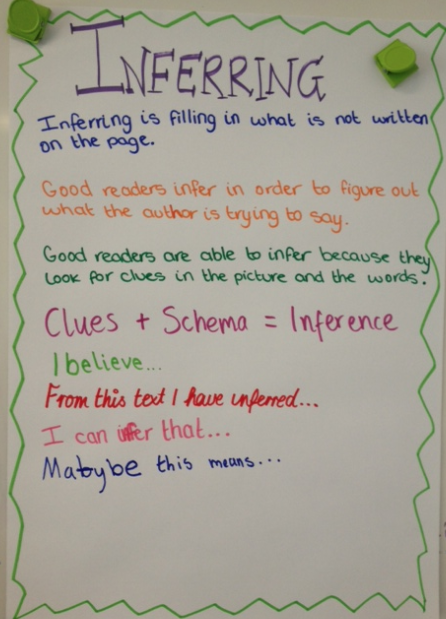 How do you think you are going with making inferences about your book? This is a great blog post and helps me understand what infering is even more. The definition is a great idea Miss Spink! I can infer that they are on the stage with one direction because they said, on the stage with 5 amazing boys and that they are singing and dancing. I already know one direction is a boy band with 5 boys and they sing and dance. I can infer that they are at the beach because they said, the sun is tanning my skin and that they can see the sea shore. In my book, Goosebumps the haunted car I have made inferences that he was scared as he was trapped inside of the car beacause he was panicking and screaming for help. Making infrences has really helped me understand the text because it allows me to connect with the charcter therefore I can tell what is happening in the text. When I didn't have this skill I was confused and was lost and couldn't explain the book to people when they asked me what was happening. This qquestion is for Miss Spink. As a teacher how often do you make inferences? Hi Miss Spink our blog is geting bigger bigger and better evey day i can't think of what to say our blog is always getting I hope our blog get's to 50000 to like that other blog we where looking at if we do get that many what will we do? great work on the blog post. I can infer that he was about to bungy jump off a cliff. Because i could tell by the cules so i used it to help me infer what was happerning in the text. if i get stuck on something i don't know in the the text.I use the clues to help me unerstnd the text more. e.g I was in a cave and it was dark there was some tears falling from my eye what am i felling? I recon infering is a inportent skill we have because if we infer we can understand the book better. can you estimate how much visitors we are going to have by the end of the year? i just started my book and by the title: into the jaws of doom.also the picture of the front of the book i infered that 1 or 2 kids walk in a musiam about dinsars. What a great blog post! I love the topic and love how you've used your skills of inference to create inference cards of your own! I'll be showing your video to my class and seeing what they come up with for answers for each one! Thanks for your comment. No we dont think you always need a text to make inferences because you can sometimes infer how people are feeling by looking at their facial expressions and body language. You can also infer where you are going in a car (if your parents haven't told you) by looking around you and using your prior knowledge. WHat are you teaching your students in reading this week? Infering is a great way to help readers understand their text more, especially in those bulky books with words you have never even heard before. Writers read many books to improve their own writing as well as their vocabulary. 1. This person is sinking into quicksand and is feeling nauseous. 2. She is trying her best to concentrate whle rock climbing and getting to the top of the rock. 3. She is enjoying her time at the beach on a hot sunny day. 4. He is playing Basketball, hearing the sounds of fans cheering his team on. 5. Fatat is almost having a 'Heart Attack' (not their song), form seeing her favourite boy band 'One Direction' perform live. Now since I have infered some of yours, can you infer mine? As my foot sunk into the gleaming, golden dust below, it felt like I set foot inside an imaginary fantasy. Now I’m placing footprints in a straight trail behind me, which I have no clue how. Though what interests me most, is how the shimmering Fireball above my head gradually sinks closer towards the deep dark blue, before my sparkling hazel eyes. Did you know that when you reread a book, you understand it more than before? P.S. Campbell should have at least finished reading 'The Hunger Games' considering the fact I have read it three times, ( Best book series I have ever read ). Bingo...last week our 5/6's were doing exactly the same thing as you! We began our exploration of inference by reading John Marsdens', "The Rabbits." There plenty of opportunities to infer in this amazing picture book. I loved your paragraphs! This is brilliant because its exactly what we are doing in Reading at the moment, Im teaching a class of Y7/8 students and I am going to show the students in my class the media here tomorrow I love the message that it presents and I think that it would be a great lesson for them. Thanks for sharing.